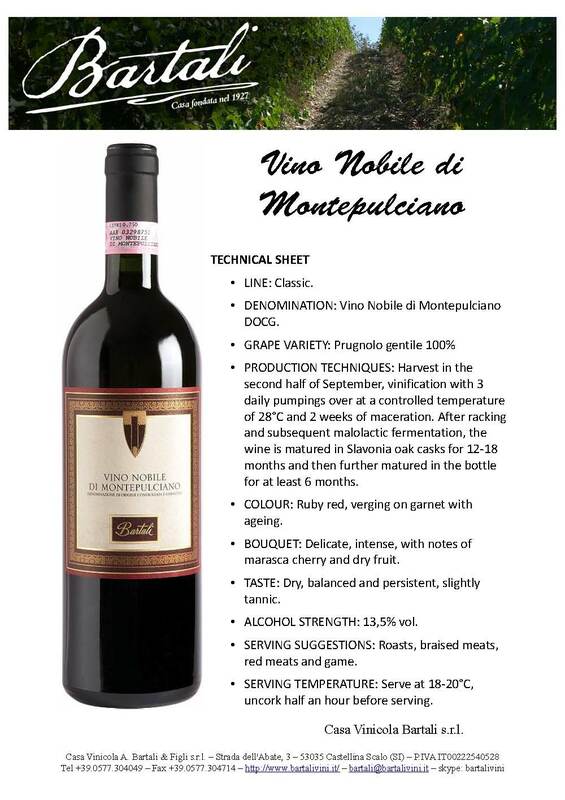 GRAPE VARIETY: 100% Prugnolo gentile. PRODUCTION TECHNIQUES: Harvest in the second half of September, vinification with 3 daily pumpings over at a controlled temperature of 28°C and 2 weeks of maceration. After racking and subsequent malolactic fermentation, the wine is matured in Slavonia oak casks for 12-18 months and then further matured in the bottle for at least 6 months. COLOUR: Ruby red, verging on garnet with ageing. BOUQUET: Delicate, intense, with notes of marasca cherry and dry fruit. TASTE: Dry, balanced and persistent, slightly tannic. SERVING SUGGESTIONS: Roasts, braised meats, red meats and game.